New Delhi: India can save three times its gross domestic product (GDP) and help the world save a million lives a year if it scales up its climate actions to help the global community limit global average temperature rise to 1.5 degrees Celsius (oC), said a World Health Organization (WHO) study released on December 5, 2018. This is a more ambitious target than the 2oC agreed under the Paris Agreement in 2015. 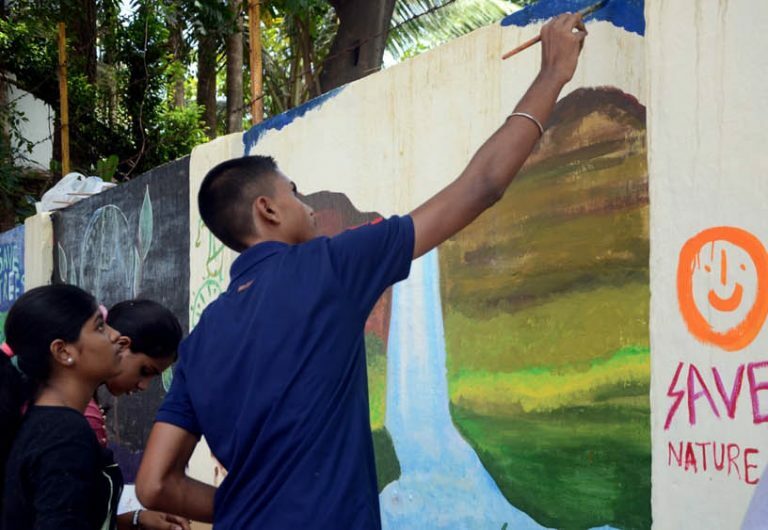 Mumbai: Children paint on walls on World Environment Day in Mumbai on June 5, 2017. The health gains from mitigating climate change would entirely offset the cost of mitigation for India, the WHO study said, adding that the gains would be equivalent to $3.28-8.4 trillion--several times India’s current GDP of $2.8 trillion. However, doing this would require massive investment, but historical emitters--the rich, industrialised countries--have failed to make good their commitments to provide funds under the Paris Agreement. “The present scope, scale and speed of climate finance are not only insufficient but not even being discussed properly,” said a paper released by India’s finance ministry on December 4, 2018, timed to coincide with the ongoing 24th Conference of Parties (COP24) of the United Nations Convention on Climate Change in Katowice, Poland. India has always championed the developing countries’ demand that historical climate change culprits should pay for mitigation and adaptation. In 2009, at COP15, developed countries agreed to channel $100 billion (equal to the GDP of Delhi) every year by 2020 to help developing countries mitigate climate change and adapt to its effects. The Paris Agreement of 2015 required rich countries to review and scale up this amount from 2025 onwards. Now, as world leaders thrash out a “rulebook” for implementing the Paris Agreement--the procedures, guidelines and institutional mechanisms for monitoring, reporting and verification of climate change goals--climate financing and finance accounting should be front and centre of the discussions, the paper said. Upto 2017, developed countries had met only 12% of their financial obligations, according to the Indian finance ministry paper. It accused developed countries of using dodgy accounting methods to inflate their financial contribution to $41 billion (equal to the GDP of Uttarakhand state) per year by 2013-14. “A government of India discussion paper in 2015 noted that [the] only credible number is $2.2 billion in 2013-14, if we restrict to country disbursements of actual climate finance on a concessional basis,” the paper said. The remaining money was either not yet disbursed, or not provided as financial assistance but as loans, etc. Rich countries are completely failing to meet their commitment, Harjeet Singh, global lead on climate change with the non-profit ActionAid, told IndiaSpend. “Worse, we have seen attempts to pass this commitment off in the form of commercial loans, straddling developing countries with more unjust debt,” he said. Therefore, developing countries such as India say the rulebook being negotiated at Katowice must clarify accounting procedures. However, the United States--which has already pulled out of the Paris Agreement--the European Union and other developed countries are skirting the issue of climate finance reporting, as the newspaper Business Standard reported on December 6, 2018. Developed countries say they will not set a date by which they will start providing upfront information on their financial contributions. They have also refused to set a date by which they will review the finances provided to see whether these were adequate, and have also vetoed any proposal that would require assessment of their financial support. Ironically, even an annual $100 billion support, provided in full, would not be enough, the finance ministry’s paper said. “This goal of $100 billion is a meagre amount in size in contrast to the actual needs assessed for developing countries,” it said, adding that even a simple adding up of all the requirements of developing countries mentioned in their climate action plans submitted to the UN climate body came to around $4.4 trillion--about 5% of global GDP. “Without real money for real action, the urgent transition the world needs to make will be impossible to achieve,” Singh said. The earth has warmed by 1oC from pre-industrial levels (before the 1800s), and any further increase is expected to have severe effects, from killing 70-90% coral reefs, causing hotter days and more frequently, rising ocean levels and temperatures, increasing the severity and frequency of droughts, setting off more wildfires and cyclones, and so on. To meet the 1.5oC target, the world must halve its carbon dioxide emissions by 2030 (relative to 2010 levels). But the four biggest polluters with combined 58% emissions--China (27%), United States (15%), European Union (10%) and India (7%)--are set to take carbon emissions to a record high in 2018, with a projected rise of 2.7% over 2017. The projections for India suggest a 6.3% emissions increase in 2018, more than four percentage points above the 2% in 2017. India’s emissions of carbon dioxide (CO2) grew 6% a year over 16 years to 2016, faster than China’s 3.2% and the world’s average 1.3%. India now emits as much CO2 as all of Africa and South America combined, The Economist newspaper said in its December 6, 2018, issue. At the same time, in 2017, there were 2,726 deaths in India that were directly related to extreme weather-related events--heat waves, storms, floods and droughts. India suffered an economic loss of $13.8 billion as a result, said the Global Climate Risk Index 2019 released on December 4, 2018. India has been ranked the 14th most vulnerable nation on a list, which is topped by Puerto Rico, which was ravaged by Hurricane Maria in 2017. The fight against climate change makes economic sense for developing countries such as India, the index showed--India could save up to $8.4 trillion dollars, about three times its GDP, if it pursues actions to limit global temperature rise to 1.5oC target rather than the 2oC target, the WHO report said. India had pledged under the Paris Agreement to achieve 40% of installed electricity capacity from non-fossil fuel sources and reduce the emissions intensity of its GDP by 33-35% (from 2005 level) by 2030, among other actions. Both these goals have been nearly attained, IEEFA said. India has made significant progress towards its intended nationally-determined contributions, to the extent that it is expected to meet the targets a decade ahead of time. Two of the country's three major climate targets--increased share of renewable energy and reduced emission intensity of its GDP--will be reached 10 years before the 2030 deadline, as per projections by the Institute for Energy Economics and Financial Analysis (IEEFA), US-based think-tank, released on December 3, 2018. The third major goal--to create an additional 2.5-3 billion tonnes of carbon sinks [reservoirs that accumulate and store carbon dioxide] through the planting of additional forest and tree cover--has remained far off. India’s forest area rose by 1% over the two years to 2017. And, even this figure is likely exaggerated and includes degraded forests and plantations, FactChecker reported on July 4, 2018. India must double down on this unmet goal, but that may not be enough. Climate Action Tracker, an independent scientific group, has said India’s current goals are not ambitious enough, and are not compatible with limiting global warming to 1.5oC.